Retina by Fujitsu. 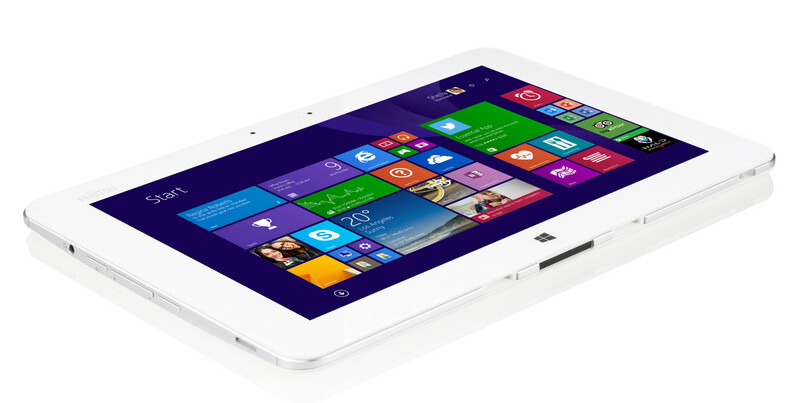 The big eye-catcher of the Fujitsu tablet is the high-resolution and razor-sharp display (2560x1600 pixels). Furthermore, you get a stylus pen, security and business features as well as an LTE modem. Is this the perfect business tablet? When you look at the price of more than 1,000 Euros (~$1313), you can already see that the Fujitsu Stylistic Q584 is no device for the consumer market. Common business features like a fingerprint reader, TPM 1.2, LTE modem and a stylus pen make it interesting for business customers. Our review shows if the tablet can convince. Competitors for the Q584 are, for example, the Toshiba WT310, the Toshiba Portégé Z10t (Convertible) and the previously reviewed HP ElitePad 1000 G2. The Q584 has a white case that is surrounded by a silver frame. The material of choice is plastic; considering the high price of the tablet we would have expected better materials. The recently reviewed HP ElitePad 1000 G2, for instance, has an aluminum chassis, and the tablet targets the same customer group. Fujitsu calls the Q584 semi-rugged and also advertises water as well as dust resistance. 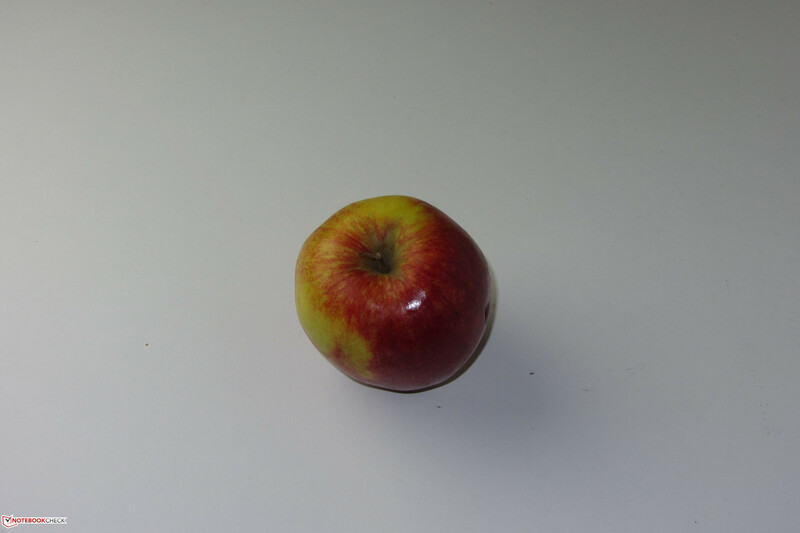 Still, there is some criticism in regard to the stability and build quality: Force on the back of the device can result in visible picture distortions. You can also slightly twist the tablet, which results in creaking sounds. We would have expected a better performance from a device for 1,200 Euros (~$1575). 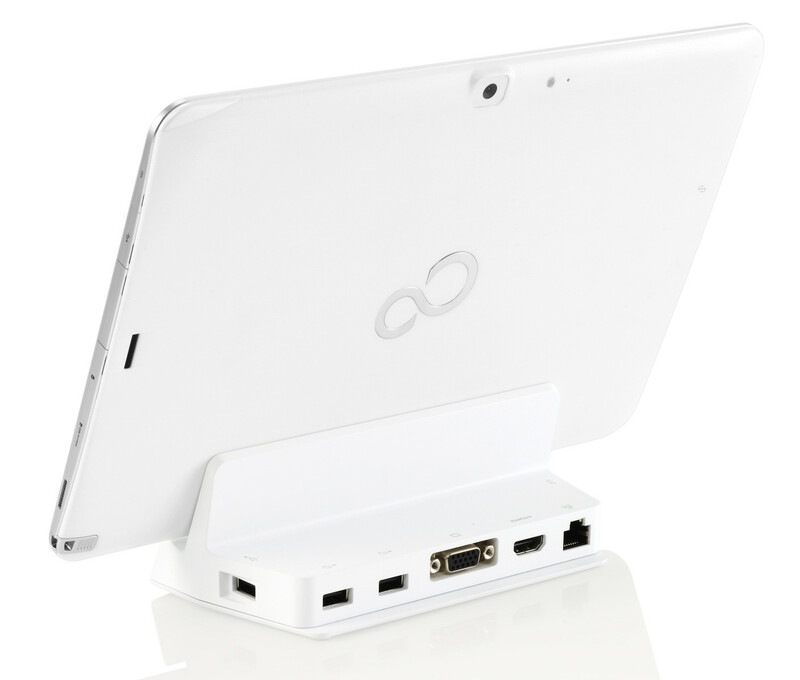 The ports of the tablet use covers for protection against dust and water – except for the docking port. Good: Fujitsu included a full USB 3.0 port (no mini or micro USB). However, there is no video out. You can use the corresponding micro-USB adaptors from Fujitsu if you need Gigabit-Ethernet, HDMI or VGA connectivity. The optional docking station (around 76 Euros, ~$99) provides two additional USB 2.0 ports, VGA and HDMI as well as Gigabit-Ethernet. 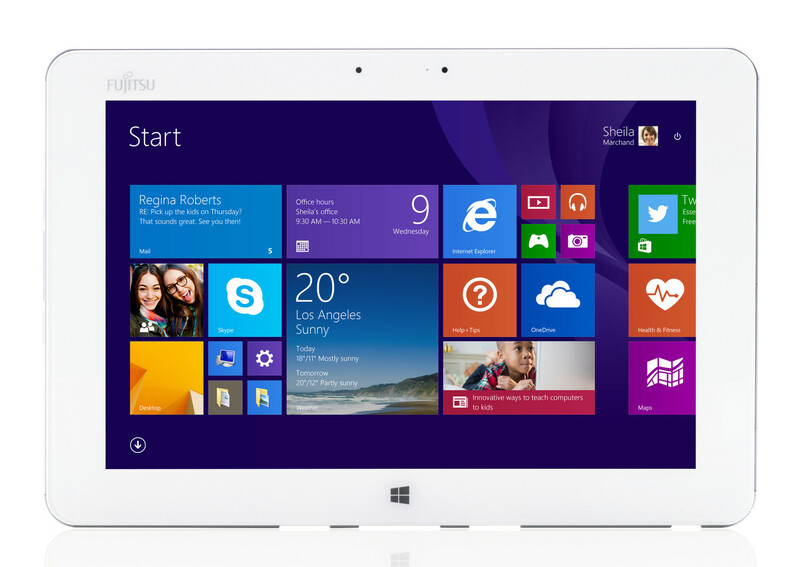 The operating system is Windows 8.1 Professional – but in the 32-bit version. A recovery DVD is provided. The touchscreen of the Q584 works without problems and executes inputs without delays. You can operate the device via fingers and stylus pen. If you don't want to use the Windows on-screen keyboard you can buy an attachable keyboard, but Fujitsu charges more than 200 Euros (~$262) for it. It should be a very high-quality component to justify this price. The Q584 has two webcams. 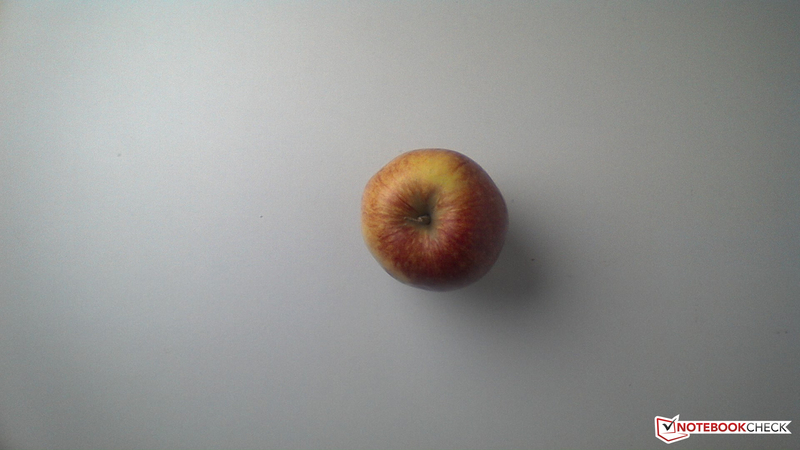 The front camera has a resolution of 2 MP and takes slightly lifeless pictures. The camera at the rear has an 8 MP sensor and is supported by a flash. The module takes decent pictures in well-lit environments. 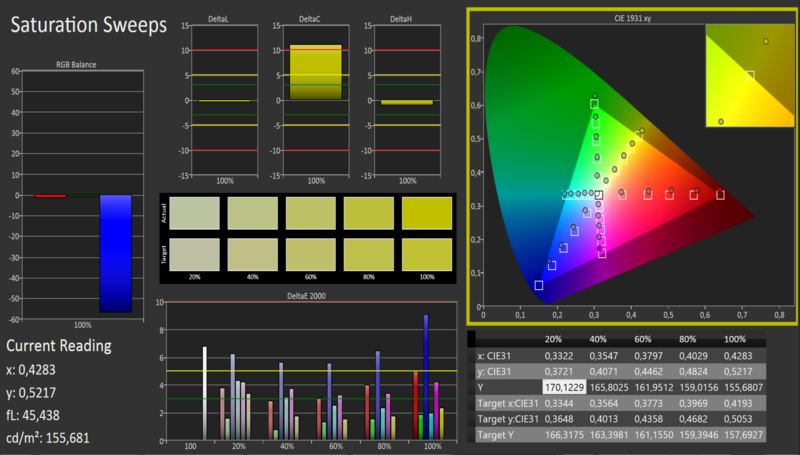 One highlight of the Q584 is the high-resolution 10.1-inch display. It has a resolution of 2560x1600 pixels. We can measure a display brightness of 290 cd/m² – a good result, although we would have expected more. The tablet was designed to be used outdoors and should not have issues in very bright environments, either. Not to forget: For the price of the Q584 you can expect a higher brightness. 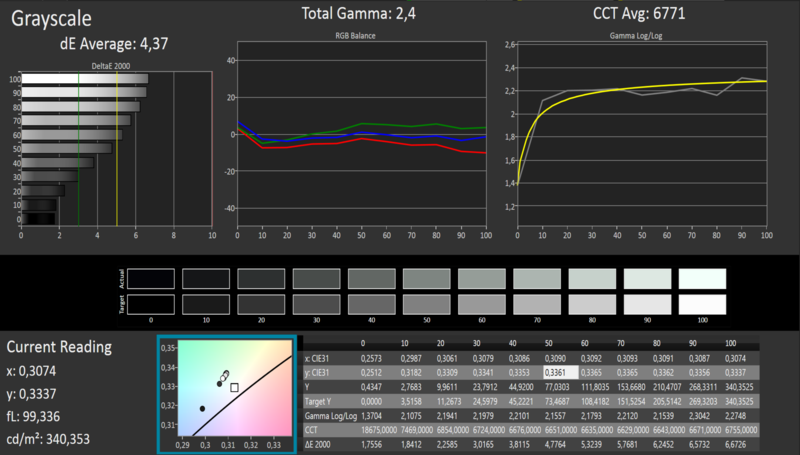 Contrast (753:1) and black value (0.43 cd/m²) are decent. 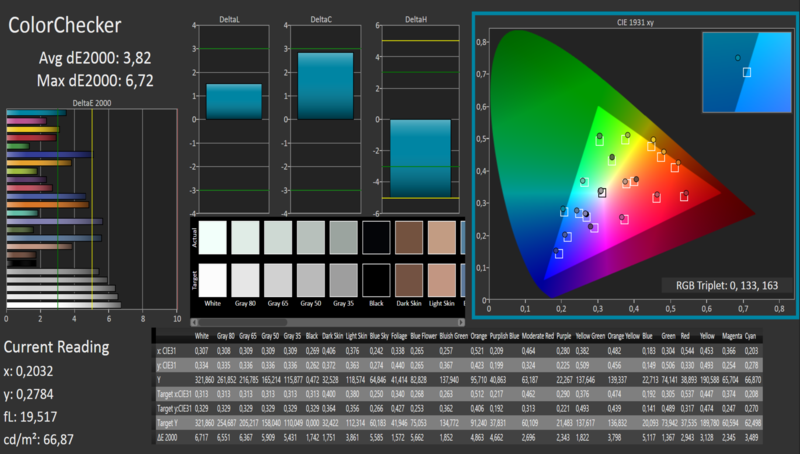 The color presentation is already convincing ex-works with an average DeltaE 2000 deviation of 3.82. This means the tablet is very close to the ideal value (DeltaE smaller 3). The display does not have a blue cast. 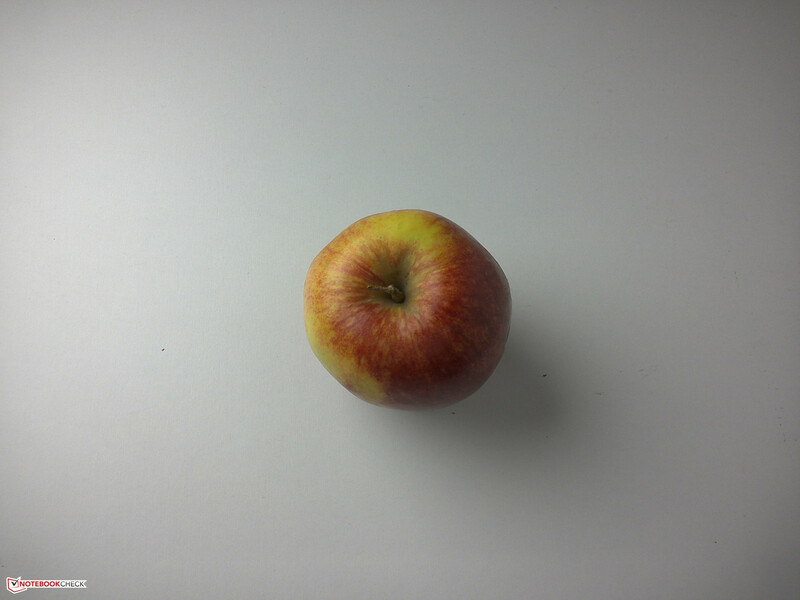 The results could probably be improved by calibration, but we could not test it because the measuring software crashed. 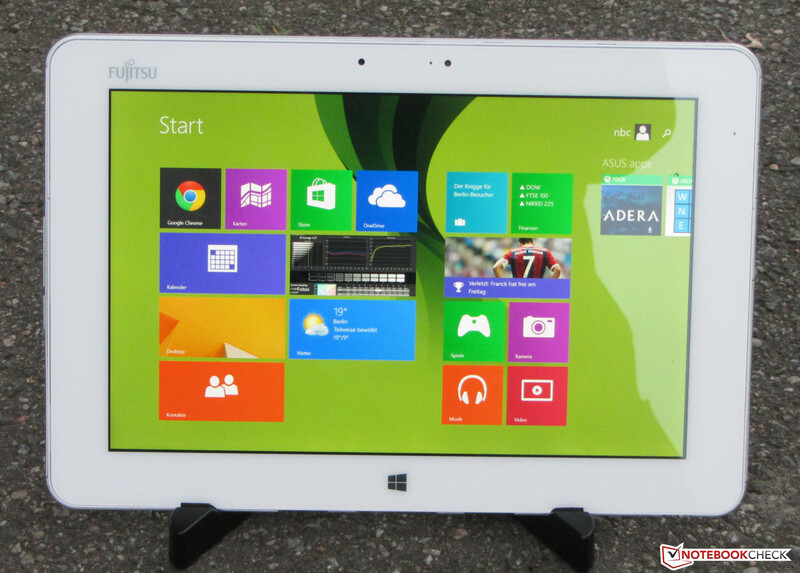 Fujitsu equipped the tablet with an IPS panel. This means you can see the display content from every viewing angle. Using the tablet outdoors is possible as well, but you should avoid environments that are too bright. The Fujitsu Stylistic Q584 is designed for business customers. It offers common security features like a fingerprint reader and a Trusted Platform Module. Internet connections on the road can be established via LTE modem. The tablet is listed for almost 1,500 Euros (~$1969) in the Fujitsu shop, but several online retailers sell it for around 1,200 Euros (~$1575). 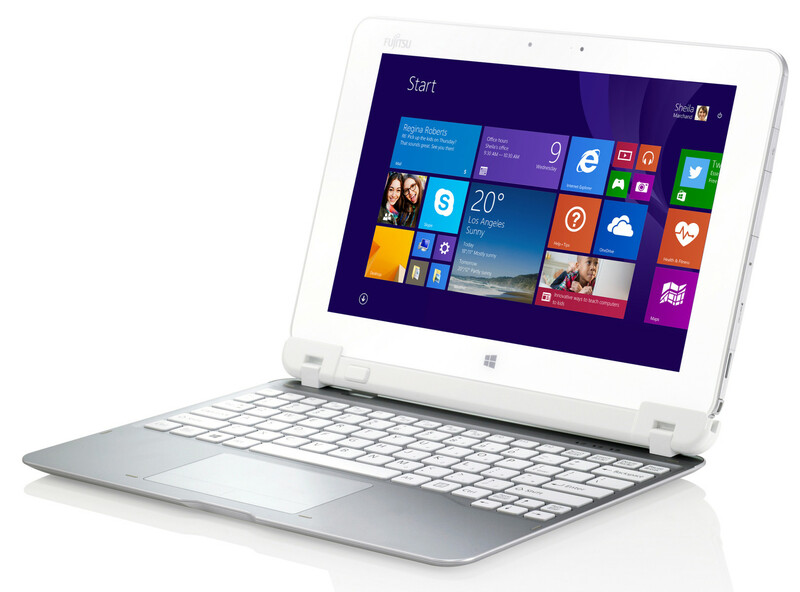 Fujitsu equipped the Q584 with an Atom Z3770 quad-core processor (Silvermont architecture). The CPU has a nominal clock of 1.46 GHz that can be raised to 2.4 GHz via Turbo Boost. The TDP is below 4 Watts. 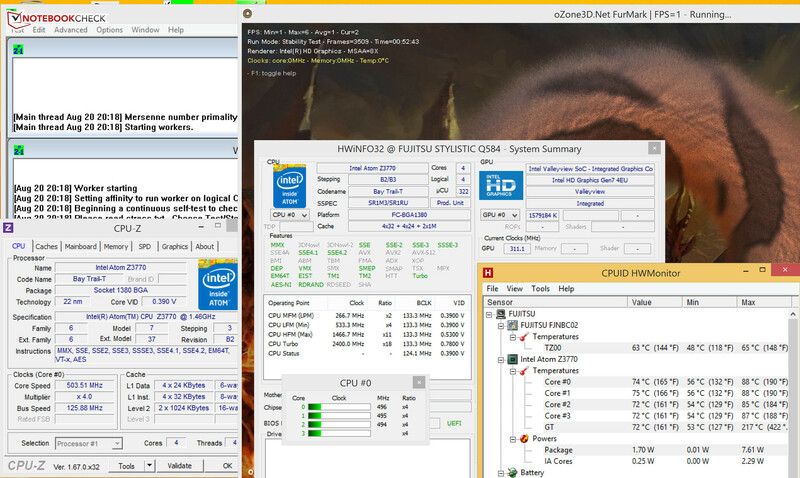 The CPU is almost able to maintain its maximum speed in the Cinebench CPU tests. We measured 2.26 GHz in single-thread as well as multi-thread tests – both on mains and battery power. All in all, the tablet is fast and runs smoothly; however, we are also a bit disappointed because we would have expected a subjectively faster device for this price. The reason for this is the hard drive in our opinion. Fujitsu only uses standard eMMC storage, which can be found in the majority of tablets. A couple of weeks ago we reviewed the significantly cheaper Wortmann Terra Pad 1060. This tablet has a real Solid State Drive (SATA) and provides a better performance in practice, despite the slower processor. Fujitsu charges more than 1,000 Euros (~$1313) for the Q584, so we would have expected more than just common eMMC storage. The results of the PCMark benchmarks don't show any surprises. We expect results in the low 1000 points range with these components and the Q584 confirms that. The storage solution inside the Q584 is an eMMC module from Samsung with a capacity of 128 GB. Around 100 GB can be used for your own data, but 30 GB of the 100 GB is occupied by the Windows installation. Considering the price of the tablet, 128 GB is not really generous and there could have been a bigger drive. The eMMC module provides decent transfer rates in general, but the results are not impressive by any means. A couple of weeks ago, we reviewed a much cheaper Windows Tablet with the Schenker Element 3G that uses eMMC storage as well. However, the storage of the Schenker tablet is faster. Graphics are handled by the Intel HD Graphics GPU. It supports DirectX 11 and runs with up to 667 MHz. The results of the 3DMark benchmarks show that the GPU is at the lower end of the performance ranking. The WT310 and the Portégé show better values due to their faster processors. Modern 3D games that were designed for desktops and notebooks hardly run on the Q584 at all. Only a couple of games can be played smoothly – with low resolutions and reduced quality settings. However, titles for the Metro-UI of Windows are no problem. The Q584 neither has a fan nor a conventional hard drive, so it is completely silent. You can feel that the Q584 does not have a fan. Two spots already surpass the 40 °C mark during idle, while the stress test can result in temperatures around 50 °C. The docking station was attached during our temperature measurements. Our stress test (Prime95 and FurMark run for at least one hour) does not show any differences between mains and battery power: The processor runs with a fluctuating clock below 1 GHz, while the GPU is steady at 311 MHz. The CPU temperature leveled off at around 72 °C. Our stress test represents an extreme scenario that is not usual in practice. Our benchmarks show that there shouldn't be any problems with throttling during everyday tasks. (-) The average temperature for the upper side under maximal load is 39.1 °C / 102 F, compared to the average of 30.7 °C / 87 F for the devices in the class Tablet. (-) The maximum temperature on the upper side is 46.2 °C / 115 F, compared to the average of 34.8 °C / 95 F, ranging from 22.2 to 51.8 °C for the class Tablet. (±) In idle usage, the average temperature for the upper side is 35.6 °C / 96 F, compared to the device average of 30.7 °C / 87 F.
The stereo speakers of the Q584 are at the bottom edges of the two sides. The sound quality is just average and lacks bass, which could be expected. We noticed that the maximum volume is comparatively low. The Q584 has a pretty high idle consumption of up to 8.8 Watts. We usually see these values for 15.6-inch notebooks. We suspect that the high-resolution display is the main reason for the high power consumption. The tablet is more frugal during our stress test (Prime95 and FurMark running for at least one hour) compared to medium workloads (3DMark06 running). The reason for this behavior is simple: CPU and GPU are heavily throttled. The docking station was attached during our measurements. The realistic WLAN test opens a new website every 40 seconds with the Balanced energy profile and a brightness of around 150 cd/m². The Q584 manages a runtime of 5:16 h. The WT310 (4:01 h) and the Portégé (4:58 h) have to be recharged sooner. A much longer runtime is provided by the ElitePad (7:17 h). Note: We usually use the energy-saving profile for the WLAN test, but the Q584 only has the Balanced profile. 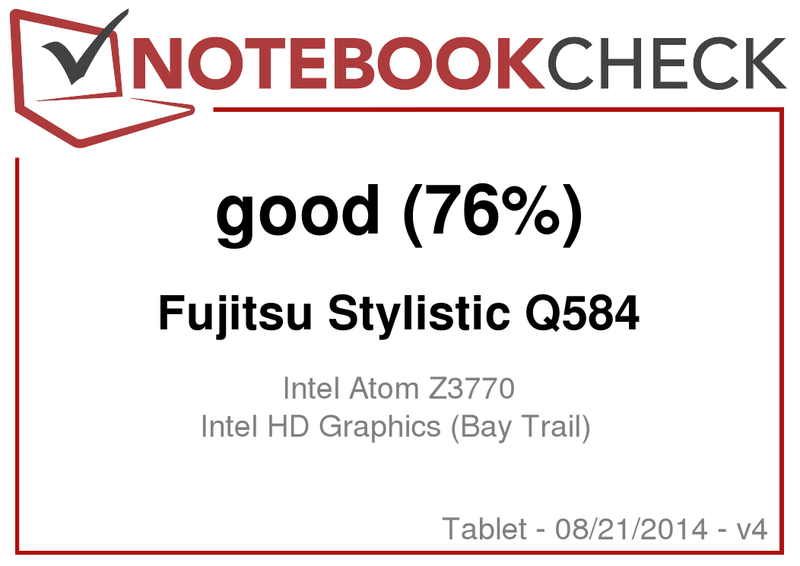 Overall, Fujitsu's Stylistic Q584 is a pretty successful Windows tablet for business customers. The majority of private users will probably avoid is because of the price. The Q584 is fast, silent and runs smoothly. The battery runtimes are on a level with comparable tablets. Furthermore, you get several security features as well as an LTE modem. We really like the razor-sharp display, but we have to criticize the case: It is not appropriate for this retail price. We would have expected a sturdier chassis with a better quality. In review: Fujitsu Stylistic Q584. Test model courtesy of Fujitsu. 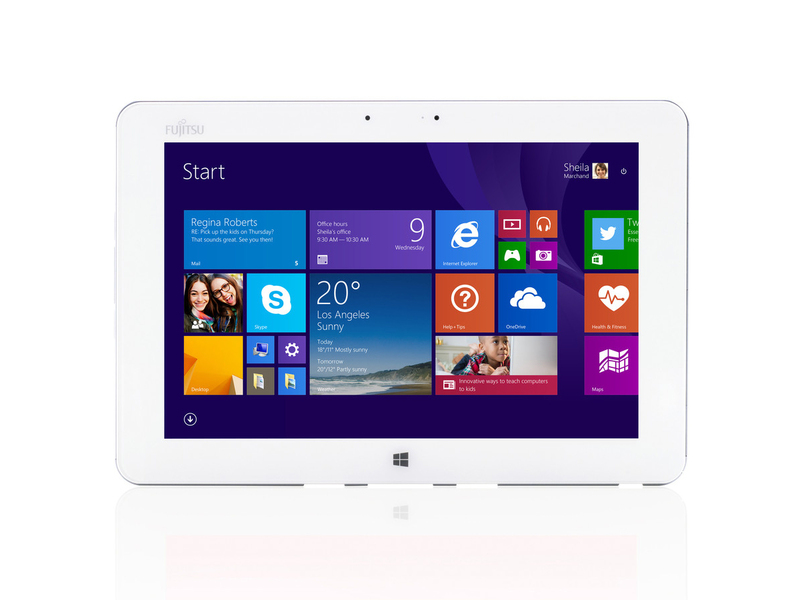 Fujitsu only equips the tablet with a plastic case despite the price of more than 1,000 Euros (~$1313). HP ElitePad 1000 G2, Toshiba WT310, Toshiba Portégé Z10t, MS Surface 2 Pro, HP EliteBook Revolve 810 G2.